I loved advent calendars as a kid, especially the ones with chocolates behind each door, though I often couldn't wait to open each one, so they never lasted until Christmas day. I wanted to make the little bears an advent calendar that could be used over and over again each year, something they would remember from their childhood and look forward to. 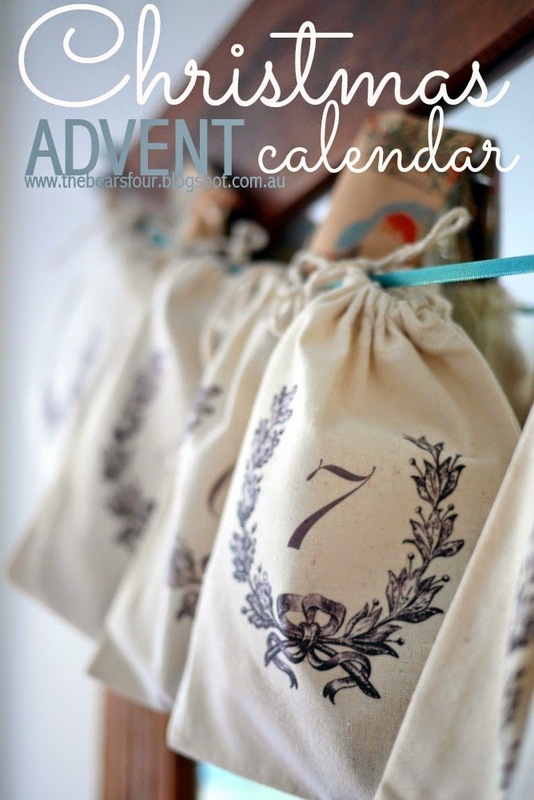 To make this sweet vintage advent calendar, click below for step by step directions. I wanted the calendar to have a vintage look to it, so I used this free wreath clip art and added a number to the centre of each wreath for each day leading up to Christmas. Step 1: Print your wreaths and numbers following the directions on the transfer paper packaging. Make sure to remember to print your images in reverse or all your numbers will be backwards when you iron them on. Step 2: Cut out each wreath and number and position them onto the calico bags making sure to centre them. Iron on the transfers following the directions on the transfer paper packaging. Step 4: Tie each closed bag in order on your velvet ribbon and hang. Step 5: Let the little ones open one bag a day.